Stories in Stone is a project offering part funded courses, it is the story of how a stunning limestone landscape has been exploited and adapted by generations of local people, incomers and visitors. It is a fascinating landscape, with a rich, highly visible archaeological record, an iconic farming pattern of stone-built barns and dry stone walls, scarce limestone habitats and a hidden subterranean world. Stories in Stone will conserve, enhance and celebrate the unique historical and natural elements of the Ingleborough Dales’ landscape. Through improved access and new learning opportunities, it will enable and inspire a wider range of people. Ground based chainsaw operation 20-03 + 20-04 (formally CS30 and CS31). Felling and processing trees over 380mm (formally CS32) 2016 only. Tree Climbing and Rescue 20-13 (CS38). Safe Use of Brushcutters and Trimmers. Lantra Level 1 Initial Certificate in Dry Stone Walling from the Dry Stone Walling Association. 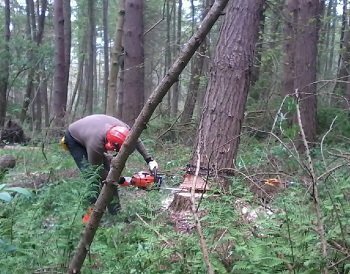 Introduction to coppicing restoration and material usage. Safe Use of Leaf Blower. Chainsaw Free Fall Techniques (formally CS39). These courses are being subsidised through Stories in Stone, a four-year programme of conservation and community projects concentrated on the Ingleborough area. The scheme has been developed by the Ingleborough Dales Landscape Partnership and is supported by the Heritage Lottery Fund. Four days training plus one day assessment. Five days training plus one day assessment. Last part funded tree climbing and rescue course! One day integrated training and assessment. Last part funded brushcutter course! Last part funded walling course! Half day integrated training and assessment. This is the only part funded chainsaw free fall techniques course. With these subsidised courses the training dates, assessment dates and fees are non-transferable and non-returnable.